Our workshop classroom at the UCSF Downtown Campus. Approximately 50 translators and interpreters representing various languages attended the three-hour “Legal Translation for Court Interpreters and Translators” workshop in San Francisco. 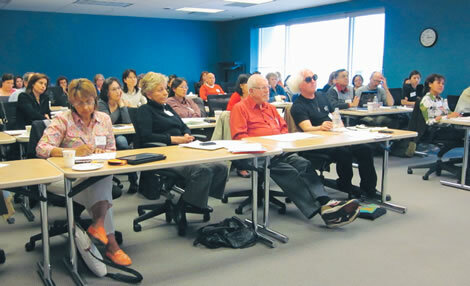 The Seminar was held on June 18th at the Judicial Council of California —Administrative Office of the Courts. Holly Mikkelson provided excellent insight and expertise on nuances often present in legal document translation. This seminar was replete with pertinent information. As a new member of NCTA, I found this seminar to be informative and full of useful tips for our profession. Mikkelson, a highly regarded authority on interpretation and translation, currently is Adjunct Professor of Translation and Interpretation at the Graduate School of Translation and Interpretation, Monterey Institute of International Studies, a Graduate School of Middlebury College. She is an ATA-certified translator (Spanish <> English) and a state and federally certified court interpreter who has taught translation and interpreting for over 30 years. She is the author of the Acebo interpreter training manuals as well as numerous articles on translation and interpretation. She is a co-author of Fundamentals of Court Interpretation: Theory, Policy and Practice. Professor Mikkelson has presented lectures and workshops to interpreters and related professionals throughout the world. Legal writing is legendarily redundant. Holly began by explaining that legal documents contain alliterations, doublets and triplets. A few examples are: on or about; lewd and lascivious; cease & desist; furnishings and fixtures; in any way, shape or form. When translating these terms, she stated, it is not necessary to find equivalents in the target language if they do not exist. Using the backdrop of an extradition translation, Holly explained that when translating a document, the translator should attempt to reproduce the appearance of the original document. Government stamps and seals, signatures, serial numbers, etc, should be in the same physical location in the translation as in the original document so that the reader can compare the two. Among the recommendations were: translator’s descriptive language should be in brackets: [signature] [rubber stamp] [text obliterated]; maintain the same pagination as the original document; handwritten comments and margin notes must be translated; they may be added as a footnote or in the same position as the original. Holly emphasized that when there is an obvious mistake in the original document the translation must stay as close to the original document. Add [sic] after the error. [Sic] is used in brackets after a copied or quoted word that appears odd or erroneous to show that the word is quoted exactly as it stands in the original. No detail should be overlooked. For example, if the seal is illegible in the original document, the translation should contain a notation in brackets to this effect. There are no official certified translators in the United States to date. Holly strongly suggested that even without such certification, translators can still validate their work by attaching a notarized statement to it, attesting that it is a true and correct translation of the original. The statement should clearly identify what type of document was received and which format it was received in (scan, e-mail, electronic, audio tape, CD). Translators then sign the statement in the presence of a notary public, who is confirming that the translator is who they say they are. The notary public does not attest to accuracy of the translation, only to the translator’s identity. Holly went over the extradition process and explained what the common requirements for extradition are; the documents required and she reviewed some extradition terminology. I found it very interesting that some countries will not extradite if the person subject to extradition will face the death penalty in the requesting country. The workshop ended with some hands-on exercises for the participants to practice in their working languages. The participants received some great resources available online to assist with translation of extradition documents such as, the extradition papers which were filed by Mexican authorities seeking the return of reality TV producer Bruce Beresford-Redman to Mexico who was accused of the death of his wife in Cancun. The 400-plus pages of the translated extradition documents can be seen in their entirety in the Los Angeles Times website. If you are a member of NAJIT, you can access an extradition glossary from Proteus. Likewise, if you are a member of NCTA, you can access the listserv Espalista for Spanish translators. An easily accessible internet resource is Linguee.com. Nina posted this article under Business, Court Interpretation, Legal Interpretation, Translation	on Thursday, September 1st, 2011 at 12:01 pm	You can follow any responses to this entry through the RSS 2.0 feed. Both comments and pings are currently closed.